Found one file extension association related to Microsoft Remote Desktop Connection Client for Mac and 1 file format developed specifically for use with Microsoft Remote Desktop Connection Client for Mac. Microsoft Remote Desktop Connection Client for Mac is used to remote Windows desktops on Apple Mac computers.Easily connect to remote Windows PCs. New Multiple Session Support gives Mac users simultaneous access to multiple Windows-based PCs or to a network server that hosts remote applications and files. Since it works with Vista and is a Universal application, Remote Desktop Connection Client 2 is compatible with the latest technologies on Windows and Mac platforms. A redesigned user interface makes this application more customizable. Create your own keyboard shortcuts; and even access and change preferences during active sessions. Print everything off your Mac. Access and print from Windows applications to any printer that can be configured from your Intel- or PowerPC-based Macs. Get fast updates and easy help. Microsoft Error Reporting Tool and Microsoft AutoUpdate are included so you can anonymously submit data on software related issues and get software updates as soon as they are available. Remote Desktop Connection Client 2 also takes advantage of the new Helpviewer and improved help topics for quick access to fresh online product help from within the application. 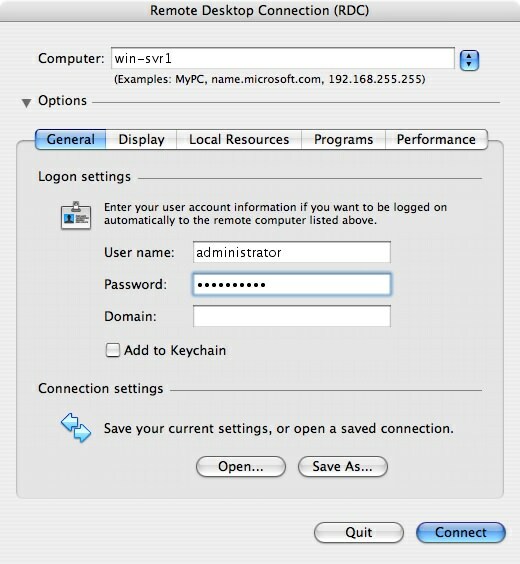 Network Level Authentication (NLA) is a new authentication method in Windows Vista that offers security enhancements that can help to protect the remote computer from hackers and malicious software. It completes user authentication before you establish a full Remote Desktop Connection. Please see Windows Help for more details on network level authentication. Using Windows Remote Desktop connection - Basics about Windows Remote Desktop Connection service.. If you need more information please contact the developers of Microsoft Remote Desktop Connection Client for Mac (Microsoft Corporation), or check out their product website.